Rangers manager Ally McCoist has defended his calls for transparency regarding the Scottish Football Association's judicial panel and insists his comments were not a signal for fans to engage in threatening behaviour. The SFA revealed on Wednesday night that Strathclyde Police have given security advice to the three members of the independent panel after their identities were revealed. McCoist had demanded the trio be named after the administration-hit club were handed a £160,000 fine and a 12-month embargo on signing players for bringing the game into disrepute since owner Craig Whyte's takeover last May. On Monday, Rangers were found guilty of five charges in relation to their finances and the appointment of Whyte as chairman. 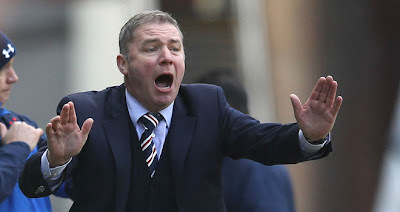 Speaking after the ruling, McCoist claimed the sanctions could kill the stricken Glasgow giants and demanded to know who had delivered the verdict. However, in a statement last night the SFA said that the three panel members in question had been subjected to 'abusive and threatening communication' after their identities were 'compromised'. Police were called into Hampden to deal with threats issued against the men responsible for hitting Rangers with a one-year transfer ban. And the entire judicial panel system has been thrown into turmoil after one of the volunteers 'outed' by internet thugs was pushed to the brink of resignation by the ugly backlash. Former Rangers owner Sir David Murray's company has been ordered, meanwhile, to hand over all paperwork relating to the takeover by Craig Whyte. Administrators Duff & Phelps are suing legal firm Collyer Bristow for £25million over their handling of the buy-out and the Court of Session has been told Murray will provide all e-mails, faxes, file notes concerning the deal.